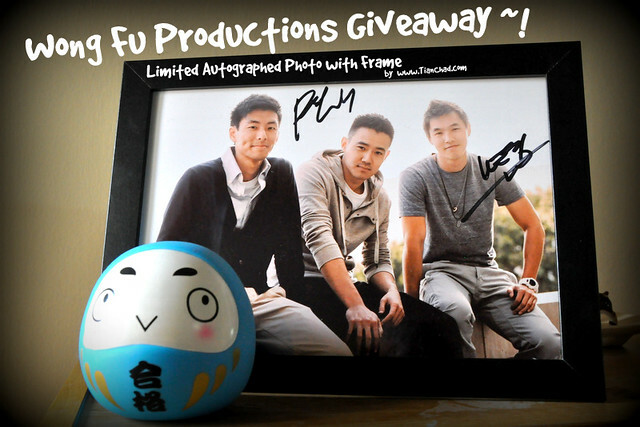 If you are a Wong Fu fans, I hope you didn't miss this - Wongfupro Autographed & Framed Photo [GIVEAWAY]. The contest has closed and I am now listing down all the participant's creative entry. Wonder who deserve to win this Limited Edition Wong Fu Autographed Photo with Frame?! Winners name will be labeled with Blue colour. Courtesy of Tian Chad @ 永遇乐, I want to own this limited edition autographed & framed Wong Fu Photo because their cre8tiveWES made me can't stop thinking about them and the PHILnomental Wong Fu 4 LYFE experience which will be reflecTED by this beautiful photo frame. Courtesy of Tian Chad @ 永遇乐, I want to own this limited edition autographed & framed Wong Fu Photo because they're Inspiring And Natural, Creatively Hilarious Also Daring! I want the honor of hanging this photo of my filmmaking role models on my wall~!! Courtesy of Tian Chad @ 永遇乐 I want to own this limited edition autographed & framed Wong Fu Photo because I didn't get to meet them in Taylor's and now I want to make up for myself, I ♥ Wong Fu!!! I'm sure you rmb me WF4LYFE! Thank you! Initially there will only have 3 winners but since I have so many good entries from you guys, I've decided to give out ONE more autographed & framed WongFu photo, Winner's name will be label with purple color. Thank you to all participants for this mini giveaway! Courtesy of Tian Chad @ 永遇乐, I want to own this limited edition autographed & framed Wong Fu Photo because putting this on my work table while I'm brainstorming for ideas, writing or editing videos will definitely give me the WongFu boost! Courtesy of Tian Chad @ 永遇乐, I want to own this limited edition autographed & framed Wong Fu Photo because seeing them once was never enough and saying I don't want this autographed frame is only a bluff; I'm Wong Fu 4 Lyfe and I follow TC for hot stuffs! Courtesy of Tian Chad @ 永遇乐, I want to own this limited edition autographed & framed Wong Fu Photo because missing Wong Fu Live in Malaysia is my biggest regrets but owning a piece of them will give me motivations to achieve success in life with full determinations. Courtesy of Tian Chad @ 永遇乐, I want to own this limited edition autographed & framed Wong Fu Photo because they are amazing, inspirational and never lose track in doing what they love while remembering their fans. Because they produce quality without needing tons of money because it's about the content. Courtesy of Tian Chad @ 永遇乐, I want to own this limited edition autographed & framed Wong Fu Photo because the presence of them in my life is iconic, producing short clips that are truly authentic, this is the best giveaway that I seek. Courtesy of Tian Chad @ 永遇乐, I want to own this limited edition autographed & framed Wong Fu Photo because they are an inspiration to me and many others to follow their dreams in whatever path that may be and in turn for us to inspire others. Courtesy of Tian Chad @ 永遇乐, I want to own this limited edition autographed & framed Wong Fu Photo because I didn't actually see him in real person but in my daily life I watch their video production that make my day brighter. As the Lucky Draw Winner for Wong Fu Autographed & Frame Photo Giveaway will be non-other than Sherry Chang. You deserve it! Congratz to all the winners and to claim your prize you must email me with your personal details (Name, Address and Tel Number) as I am going to mail them to you in fine state or we can meet up to collect your prizes! Thanks again to all who had join the giveaway! Take good care of it when it reach your doorstep! WONG FU 4 LYFE!